Despite the efforts of game companies to cut production costs, they spent more resources on developing items, animations, and special effects each year. One way to reuse game characters’ animations is to change the interaction techniques that trigger such game actions. An interaction technique is a specific way to use an interaction device to perform an interaction task. 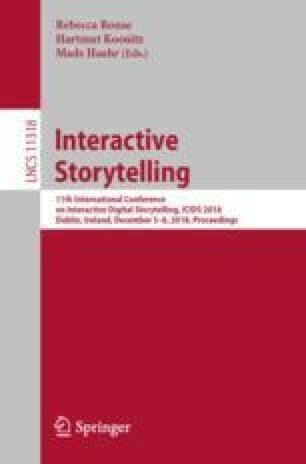 Our research focused on eight interaction techniques for the digital button: Press, Rhythmic Press, Hold, Hold and Release, Opportunity Press, Quick Press, Time-Limited Hold, and Pump. To make these changes significant for the player, the game narrative must support them. We defined a model to guide game designers in making these modifications based on the interaction techniques’ characteristics. This model offers two possibilities, increasing or decreasing the interaction techniques’ complexity. As we did not find existing cases on the market nor in the literature, we developed a game and used the decreasing complexity approach as a proof of concept. In this way, we demonstrate how it is possible to change interaction techniques without adding new animations or items to the game. We hope that game designers can use our model to change interaction techniques while keeping the game narrative coherent and refreshing the player’s experience. This research has been supported by the Federal Institute of Pernambuco.